An adorable hand drawn bear waving and saying 'thank you' features on this versatile card which is available in singles and packs. 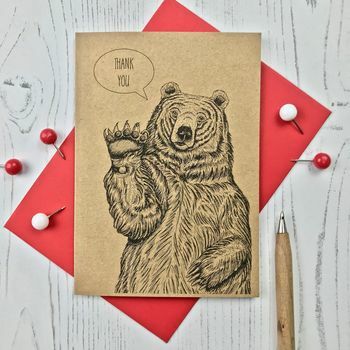 This cute waving bear card is useful for a variety of ocassions such as baby birth and thinking of you. The card is made from medium wieght recycled white card and is A6 size (10.5cm by 14.5cm). Available in singles or packs of 5 or 10. It comes with a good quality envelope and is well-packaged to ensure it arrives in perfect condition.